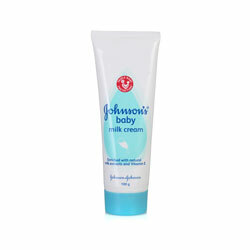 Buy Johnson's Baby Milk Cream - Johnson & Johnson Baby Products Online India. Johnson's Baby Milk Cream helps moisturize your baby's skin. Keeping it smooth and soft. It contains natural milk protein. It is non-greasy, light and fast absorbing, hence suitable for all seasons. Apply daily on face and body. Clinically proven mild, safe for use on babies. Good for baby, good for you. For external use only. Keep out of reach of children. Discontinue use if skin irritation occurs.